Rovio, makers for the super popular Angry Birds series of games, has updated two of the oldest games in the franchise. Angry Birds has gained a few new levels while Angry Birds Friends sees the launch of a new tournament. 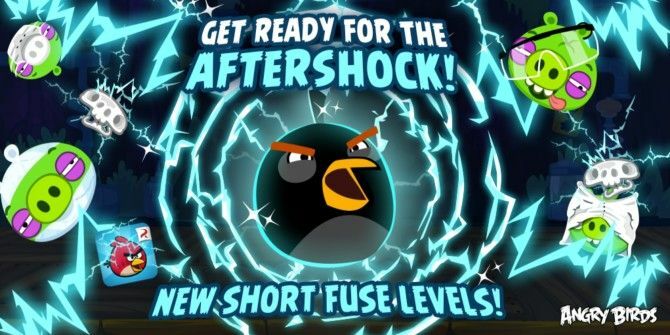 Back in November, the original Angry Birds saw the introduction of a new character, the Bomb Bird Angry Birds Updates With 30 New Levels, ‘Shock Fuse’ Bomb Bird & Pig Potions Angry Birds Updates With 30 New Levels, ‘Shock Fuse’ Bomb Bird & Pig Potions Read More , which can emit a shock wave, a powerful circle of electricity followed by an almighty blast. And you could use it over the 30 new levels launched with it. Well, Bomb Bird has a short fuse and is ready to take on more piggies, so Rovio has got 15 new levels for you to deploy this new weapon and get the eggs! The update is freely available for the classic Angry Birds on iOS and Android. As usual, if you get stuck, rely on our top 7 frustration fixes for Angry Birds The Top 7 Angry Birds Hints & Tips To Help You With Your Frustration The Top 7 Angry Birds Hints & Tips To Help You With Your Frustration Even though I love computer games, there's a very good reason why I'm not keen on trying on new games. It's because I love games too much that it's hard for me to stop once... Read More . The villainous El Porkador is causing havoc with his minions and the only one who can stop him is the masked hero Wingman and his feathered friends! For this week-long tournament we’ve unlocked the Infinite Wingman bundle for all players, so you can really serve the pigs a healthy knuckle sandwich! The tournament is on till the 9th of March, so log into Angry Birds Friends on your mobile or on Facebook and have fun! Explore more about: Angry Birds, Facebook.